Georgia and the Pentagon cooperate closely. Georgia has a 2,000-strong contingent supporting the U.S.-led coalition in Iraq, and Washington provides training and equipment to the Georgian military. Georgia last week recalled its ambassador in Moscow in protest at Russia sending fighter jets into Georgian airspace. Tbilisi urged the West to condemn Russia’s actions. Russia said the flights were to prevent Georgian President Mikheil Saakashvili from launching a military operation against the separatist South Ossetia region. Moscow accuses Saakashvili of preparing to restore Tbilisi’s control over South Ossetia and the second breakaway region of Abkhazia by force. Tbilisi says that is a pretext for Russia to effectively annex large chunks of Georgian territory. Go here for the July 15, 2008 MSNBC report. Not only the land exercise with US troops on Georgia soil, but Georgia was also involved with the US and other local nations in a sea war exercise, “Exercise Sea Breeze 2008.” It concluded on August 3rd, only days before Georgia launched what it hoped was a blitzkrieg like strike against the government of the autonomous South Ossetia. Go here for a report on Exercise Sea Breeze. “Georgian tanks and infantry, aided by Israeli military advisers, captured the capital of breakaway South Ossetia, Tskhinvali, early Friday, Aug. 8, bringing the Georgian-Russian conflict over the province to a military climax.” See this report. The Times of London’s online newspaper reported from the war-ravaged capital of South Ossetia that it was receiving claims that civilians were targeted in last week’s assault by Georgia. These claims, some of them unverified, included that Georgian troops had killed women and children. Reporters on the scene, however, reported that parts of the capital of Tskhinvali were still in flames several days after the Georgian attack last and the Russian counteroffensive. One claim alleged that Georgian troops deliberately killed civilians as they went along the a major road trying to escape from South Ossetia. The Georgians have denied any of these claims. One woman who ran a children’s center that became a meeting place for refugees told a reporter that she had witnessed a plane from Georgia try to bomb fleeing civilians. Thousands of refugees came through the center and many had stories of attacks against civilians. “I am ready to cry at the whole of the world. I am ready to go to Europe to tell,” said Ms Nativa Gogichaeva, 33, slamming Western newspapers for not covering the Georgian assault on South Ossetia. A nurse working in Tskhinvali, told The Times that she had treated many civilians with bullet wounds.A Reuters journalist who visited the town reported that more than 200 wounded in the fighting were being treated in the hospital. Doctors had to work in the basement under unhealthy conditions as the hospital itself had been hit by Georgian artillery strikes on the first day of the conflict. The article reported that “there were also reports of violence directed at ethnic Georgians. In villages once populated by Georgians on the outskirts of Tskhinvali, South Ossetian fighters reportedly set fire to Georgian houses, and carried out searches in the villages.” See this news report. 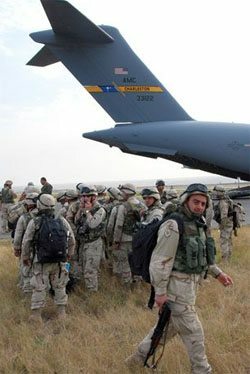 On Monday, August 11, 2008 the New York Times reports that Russia is escalating its war with Georgia, “moving tanks and troops through the separatist enclave of South Ossetia and advancing toward the city of Gori in central Georgia” and even bombing parts of Tibilisi, the Georgian captial. Bill Kristol: [Georgia] has had the third-largest military presence — about 2,000 troops — fighting along with U.S. soldiers and marines in Iraq. For this reason alone, we owe Georgia a serious effort to defend its sovereignty. Surely we cannot simply stand by as an autocratic aggressor gobbles up part of — and perhaps destabilizes all of — a friendly democratic nation. The mood is reminiscent of Germany after World War I, when Germans complained about the “shameful Versailles diktat” imposed on a prostrate Germany by the victorious powers and about the corrupt politicians who stabbed the nation in the back. For original post, go to ThinkProgress here. The OB Rag is doing some of the best reportage (or summaries of reportage) and commentary on the South Ossetia crisis anywhere!! I can’t help think about US support for other “democratically elected” governments, like El Salvador in the 80s, where torture and slaughter was what the “enemies” got. 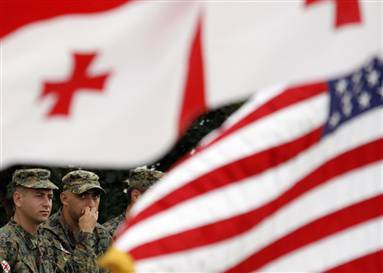 Our support for Georgia’s provocative and brutal move on South Ossetia may be just as bad for prospects. . . . except that El Salvador at least was within our sphere whereas Georgia is thousands of miles away and borders on Russia . . . where is this going? Thanks, OB Rag, for all the info and help understanding. Dickie – thank you kindly for your warm comments. You’re right though, scratch the surface, and voila! – guess what? Our own government is involved. Yesteryear, it was Central America, today it’s Euro-Asia. There really was an absence of coverage of the unfolding events in South Ossetia/ Georgia among progressive blogs and alternative newsites on the net at the beginning of the conflict. Your appreciation means a lot to us.